Gilden 7.75 oz. 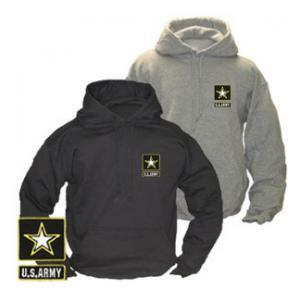 50% Cotton/50% polyester long sleeve hoodie or equivalent, pill-resistant air jet-spun yarn, double-lined hood with matching drawstring, double needle stitching throughout, set-in sleeves and 1x1 rib knit cuff and waistband with Lycra. Army logo embroidered on left chest. Embroidered in the USA.